Proposed LED sign on City Point, Temple Gate. 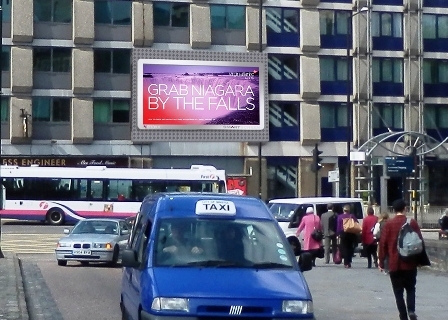 For several years the Society’s Planning Applications Group has been campaigning to limit the spread of LED advertising screens. The light from LED adverts is intense and has a much longer reach than conventionally illuminated screens. As an example, the LED screen adjacent to St Philips Causeway is clearly visible from planes approaching Bristol Airport. PAG contends that the screens are harmful to their surrounding neighbourhood, particularly in conservation areas and where they shine directly into residential development. We also argue that they are a threat to public safety when they distract road users. Remember that adverts are there to attract attention and bright screens with frequently changing images are designed to do that more effectively. Many of these screens have been refused consent by the Council which the Society has welcomed. Equally gratifying has been the decision of planning inspectors to uphold the Council’s refusals in most cases. LED screens have been refused outside the Galleries, near Bath Bridge and on the building opposite the exit from Bristol Temple Meads station approach. You might also be interested in three other current applications for these screens. One is another application for the site referred to above opposite the approach and exit road to Temple Meads. The Society has argued that this application, for a screen 8 metres by 4 metres, is a serious threat to road safety at such a busy junction where people might be taking more risks to catch trains. We also contend that the screens would be harmful to the setting of the Grade I, II* and II Listed Brunel and other railway buildings plus the former George and Railway Hotel nearby. The other two applications are for a large screen 8 metres by 5 metres in Bond Street and Temple Way. The applicant is J C Decaux on behalf of Bristol City Council. The first of these faces south and would be located in the layby close to the House of Fraser. PAG considers that light from this would bear directly on to St Mathias House which would be very intrusive for residents adding to the air quality and traffic noise issues they already experience. It could also affect other residential buildings nearby. This is also a very busy stretch of road with cars and cyclists changing lanes and a bus lane adjacent to the pavement. There are also pedestrian crossings close to the site of the proposed screen. The second faces north and would be located in the central reservation just south of Temple Bridge. This is immediately adjacent to the Redcliffe Conservation Area and the Society considers that it would be harmful not only to this but to the boulevard that has been created along Temple Way. Again, we are concerned about the potential danger to road users on this busy road. These last three applications are still under consideration. Their application references are 18/01751/A, 18/01892/A and 18/01897/A respectively. If you would like to add your own objections, and the more objections the better, you can do so on the Council’s website in the planning applications section. You could also write to your Councillors, particularly concerning the proposals submitted by the Council’s agent.